Founded in 2005, Humanity in Action France (HIA | France) is a registered association loi 1901 and designs international educational programs for decision-makers of today and tomorrow. These educational programs are designed to help students respond to the challenges that democratic countries face as they become more diverse societies - including training on diversity issues, discrimination and equal opportunity in a historical, comparative and action-oriented perspective. In doing so, Humanity in Action France aims to educate a new generation of social innovators who will take action to build more inclusive and cohesive societies - and at promoting knowledge and dialogue among public institutions, businesses and civil society. 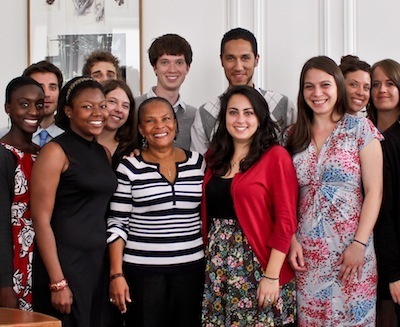 The French Humanity in Action Fellowship is organised in Paris or Lyon and gathers university students from France, the United States and other European partner countries. Our programs explore past and present examples of resistance to intolerance, with a goal of encouraging future leaders to be engaged citizens and responsible decision makers. Humanity in Action France also supports an active network of over 1000 French Senior Fellows who are committed to being active and engaged citizens in their own communities. Apply for the Humanity in Action Fellowship.